After 20 January, 2017, Donald Trump will command America’s enormous power. His order will launch a devastating attack on any country. Sanctions will descend at his pen stroke. Alliances will be his to offer. Yet one kind of foreign power will defeat Trump—as it has defeated presidents for 40 years. This is the power that comes from the world’s consumers, who buy billions of dollars of oil a year from violent and repressive foreigners. In 2014, for instance, the average American household sent $250 to autocrats and armed groups, just by paying at the pump. This old law for oil fuels conflict and oppression. Imagine that New York had a law saying that any goods seized by force in New Jersey could be bought legally by New Yorkers. We’d see turf wars, kingpins, and protection rackets in New Jersey—just what we actually do see, on a much larger scale, in countries along the world’s main artery of oil, which stretches from Siberia through the Middle East to Africa. Map showing ‘the oil curse’. Image by Leif Wenar. Used with permission. 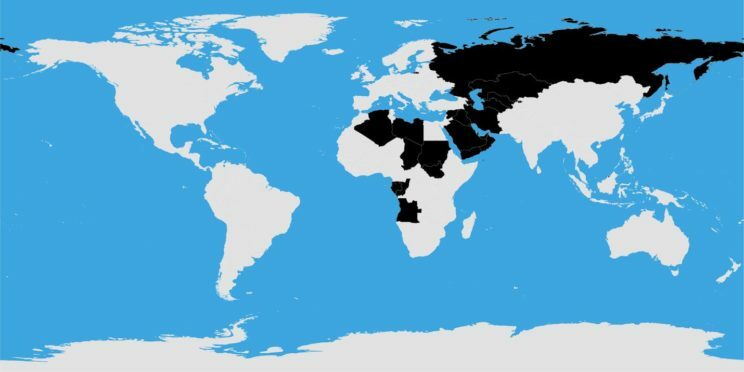 The map shows the oil states that are authoritarian or failed—this is ‘the oil curse.’ Because military control over oil wins big money, armed groups fight to seize the oil (as in Iraq and Libya). Because we buy oil from whatever strongmen can control it, they can crush protests, buy off threats and propagandize their people (as in Russia and Saudi Arabia). For a generation, oil-cursed countries have sent the West its worst threats and crises: ISIS, Assad and the Syrian refugees, Putin’s aggressions, Gaddafi’s explosive plots, Al Qaeda, Saddam’s invasion of Kuwait, the Soviets’ nuclear surge in the 1980’s, Iran’s state-sponsored terror. And, over four decades, the Saudi regime has spent tens of billions of petrodollars to spread their intolerant, medieval version of Islam worldwide—which we now see mutating into home-grown extremism across Europe and inside America. US presidents have tried three strategies to control the power of oil from outside the country. Some presidents have tried alliances with the petrocrats: the Shah of Iran, Saddam, Gaddafi, the Saudi kings. Some presidents have tried military action: Gulf War I, Gulf War II, Libya, drones. Some presidents tried imposing sanctions: on Iran, Iraq, Sudan, Syria, Russia. Americans argue over the morality of these strategies—but even beyond morality, what have the real results been on the ground? CIA Director John Brennan gave his verdict in March. The Middle East is the worst it’s been in 50 years, Brennan told Congress, and it faces unprecedented bloodshed. All of these presidential strategies have failed. The power of oil can’t be checked from outside oil-cursed countries. The power of oil can only be controlled from inside these countries. In countries where the government is even minimally accountable to its citizens—like Canada, Mexico and Norway—oil does not fund civil war or despotism. The United States can abolish its bad old law of ‘might makes right’ by passing a new law: we’ll only import oil from countries where there’s a government that’s minimally accountable to its people. We’ll taper off imports from all countries in black. Economically, this will be easy. Nick Butler, a former top BP executive, says the transition could be made in months and would be virtually costless. With America’s help, our European allies could build new infrastructure and join us in a few years. 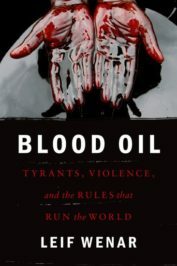 The West doesn’t need to buy blood oil any more. America’s taking a peaceful stand for the rights of all peoples will strengthen the democratic reformers in oil-cursed countries, who are the only hope for a durable peace in the Middle East. Today the peoples of oil-cursed countries are struggling against men who are using our money to oppress and attack them. It’s time to get on the side of the people. Think of how angrily Americans have divided for 40 years over how to handle the oil curse: whether to invade or not, impose sanctions or not, tighten national security at the expense of our personal freedoms. So much bad blood from our fights, even between Americans of good will. Americans can now come together in affirming a principle from Lincoln’s first inaugural address: a country belongs to its people. Featured image credit: ‘Oil pump’, by skeeze. CC0 Public Domain via Pixabay. Leif Wenar holds the Chair of Philosophy and Law at King's College London. He earned his degrees in Philosophy from Stanford and from Harvard, where he worked with John Rawls and with Robert Nozick. He has been a Visiting Professor at Princeton and at Stanford, and has been a Fellow of the Carnegie Council Program in Justice and the World Economy. He is the author of Blood Oil: Tyrants, Violence, and the Rules That Run the World, soon to be released in paperback (OUP, 2016 & 2017). The opening paragraph was hilariously breathless in its hysterical monster movie depiction of the inauguration. Well done. As for Lincoln’s hypocritical ruminations on “might” and “right”, well… had he actually chosen freedom over union, there might not now *be* an American hegemony, and an “oil curse”. This seems like an excellent argument for reducing government power. If you hate Donald Trump so much you’d rather not see him with that power, how about shrinking the state to a minimum? Oh, that’s right, we only need the right Top Men in charge. I agree that “right makes might” is a much better law to live by than “might makes right” I also agree that we should only do business with countries that treat their citizens well and whose governments are at the very least “minimally accountable to [their] people.” Thanks for writing this and posting it.